Austria is a Central European country (coordinates 47 20 N, 13 20 E) with a total size of 83,870 square kilometres. It is slightly smaller than the US state of Maine. It is characterised by its diversity in different landscapes, ranging from high alpine terrain to the Pannonian plains in the East. Elevation extremes: Austria′s highest point is the peak of Mount Großglocker (3,798 metres), its lowest point is lowest point is Lake Neusiedler See (115 metres). Austria′s neighbours are (clockwise from North): Germany, the Czech Republic, Slovakia, Hungary, Slovenia, Italy, Liechtenstein and Switzerland. Austria is landlocked and has no access to the sea. The biggest river is the Danube. Austria has a temperate, continental climate; winters are cold and wet or snowy, summers are generally moderate and warm. The coldest months are January and February (below freezing); the warmest months are July and August (up to 35 degrees Celsius / 100 degrees Fahrenheit). Austria′s biggest cities are Vienna (1.7 million), Graz (244,000), Linz (188,000), Salzburg (148,000) and Innsbruck (116,000). (see also "Physical Geography"). 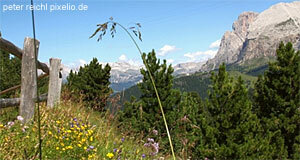 Austria′s total population is 8,193,000 and grows by a mere 0.09 percent per year. The life expectancy at birth is 79.07 years (76 years male, 82 years female). Ethnically, 91.1 percent of the population are (German-speaking) Austrian; 4 percent Slavonic (Croats, Slovenians, Serbs and Bosnians); 1.6 percent Turks; 0.9 percent Germans, 2.4 percent unspecified (2001). The official language is German, English is widely spoken especially among younger people. Administrative languages are also Croatian and Hungarian in the Burgenland and Slovene in Carinthia. Officially acknowledged minorities Croats, Czechs, Hungarians, Roma, Sinti, Slovaks and Slovenians. 73.6 percent of all Austrians are Catholic, 12 percent follow no religion, 4.7 percent are Protestants, 4.2 percent Muslims, and 4.2 percent follow other religions. Austria is a democratic republic with nine federal provinces (from west to east): Vorarlberg, Tyrol, Salzburg, Upper Austria, Carinthia, Lower Austria, Styria, Vienna and the Burgenland. Austria is a member of the European Union and has signed the Schengen Agreement for a common policy on border controls. Austria′s currency is the Euro. Austria is also a member of the United Nations and the European Union. It has signed the Schengen agreement. Significant parties are the SPÖ (Social Democrats), ÖVP (Conservatives), Grüne (Green Party) and FPÖ (Rightwing Populist). For further details, see my article on Austrian potitics.